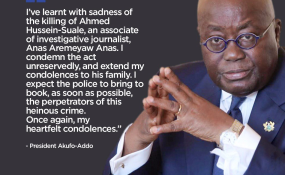 Unknown assailants in Ghana's capital, Accra, shot and killed the investigative journalist Ahmed Hussein-Suale. Through their work, he and his colleague Anas Aremeyaw Anas' had exposed corruption in Ghanaian football. The journalist Ahmed Hussein-Suale was shot dead by unknown assailants as he was driving home on Wednesday evening. "A few minutes after he left the house, we heard gunshots, and when we rushed out, we saw him in his car. He was shot twice in the chest and once in the neck," his cousin Musa Mohammed told DPA. Ghanaian authorities subsequently announced an investigation, following calls to do so, including from the Committee to Protect Journalists. Hussein-Suale is a colleague of the well-known undercover journalist Anas Aremeyaw Anas and part of the Tiger Eye Private Investigations team, which has worked to expose corruption. Ghanaian MP Kennedy Ayapong, who was implicated by one of their investigations, incited the public to attack the journalist. On a private television channel last year, the MP showed a foto of Hussein-Suale and promised payment for supporters who took retribution against Husein. "That boy that's very dangerous, he lives here in Madina. If he comes here, beat him," he said. Kissi Agyabeng, Hussein's lawyer, said that Ayapong must answer for this. "He invited the world to beat him up and said he will pay for it and now he has been killed," said Agyabeng. Kent Mensah works with Anas' communication and media team and said that Hussein-Suale's killing shocked them all, albeit also saying that such a threat was long anticipated and would not silence the team. "I don't think Anas is going to be ever shaken, he understands the risk involved in this game," Mensah said. The team's reporting led to a ban on several football referees and officials, including the president of the Ghana Football Association, for receiving cash from undercover journalists posting as agents last year. Award-winning journalist Anas Aremeyaw Anas is best known for concealing his identity by always wearing hats and covering his face when he does interviews. A previous investigation by Anas revealed corruption in Ghana's judiciary system. "But we shall not be silenced. Rest in peace, Ahmed," Anas tweeted after learning of his colleague's death -- also reposting the video of Ayapong calling for an attack on Hussein. Ghana is ranked 23rd out of 180 countries in the Reporters Without Borders 2018 World Press Freedom Index.